This is a brief comparison of two eyepieces I use for microscope photography. The eyepieces are a Nikon PL 2.5x projection lens and a Labomed 10x WF eyepiece. The camera is a Canon 5D MkII mounted on an infinity corrected Labomed LB-592 microscope. The two eyepieces are as different in function as night and day. method and length of the extension tubes required to move the camera back far enough to fill the full frame sensor of the 5D. the Labomed tubes are 125mm. The Nikon PL 2.5x lens is big and required the use of a 1.25" telescope adapter to fasten the extension tubes to the photo port. have on the length of the extension tubes. at first glance how close they were in quality. the Labomed having a 10x magnification factor. came to light. Chromatic Aberration (CA). Images taken with the Labomed 10x WF show definite purple fringing around the edges with occasional green fringing. The Nikon PL 2.5x did not show any noticeable artifacts and is a bit sharper. from the Postscript output for a Designjet 130nr PS. re-sampled to half size from the original Canon 5D RAW files. I switched eyepieces, but the comparison is still OK. While you were adjusting things, did you also raise the projection lenses so that the camera would be parfocal with the normal eyepieces? It's probably not 10X in this configuration. The magnification of normal eyepieces is specified as 250 divided by focal length, so a 10X eyepiece is just a 25 mm lens. If you place that 125 mm away from the camera, you'll get more like 5X, not 10X. Have you checked magnification against something of known size, like a stage micrometer, a fine ruler, or the dot spacing of a half-toned image? I do not use the oculars of the microscope. They are 22mm in dia. and do not fit in the photo port. I do all of my viewing on the computer and the Live View function of the Canon 5D so parfocal is not meaningful to me. The microscope has a push/pull rod that removes the prism from the optical path directing 100% of the light to the photo port and the camera. I do have a 1mm calibration slide, but am probably not using it correctly. What I have done is display the slide on the LED monitor display for each objective and measure the width of the .1mm space as it is displayed for each obj. For what it is worth, these are numbers. With the above numbers, I assumed the camera magnification plus the projection lens 2.5x x Obj. equals 25x. Let me put it more gently: you may be using the words and numbers in ways that are different from what we're used to. But rather than worry about that right now, I would like to understand better what you're doing. I gather these are the numbers with the Nikon PL 2.5x. 1. What are the corresponding numbers when you run the same experiment with the Labomed 10x WF eyepiece? 2. On your monitor, what is the width of the full image captured by the Canon 5D? Posted: Tue Oct 28, 2014 8:37 am Post subject: A table of magnifications in mm. These are the numbers from the three methods used when the Canon 5D is the camera. The two eyepieces are the Nikon PL 2.5x, Labomed 10x WF and an OMAX 2(2x) full frame camera adapter. The Canon Live View sends a 1920 x 1080 HD image to the computer, but the Canon Utility displays it as a 1600 x 900 window on the 27" LED 1920 x 1080 display. Select the obj., focus, measure the width of the 1mm image for the 2x & 4x obj. and the .1 mm div for the 10x, 20x & 40x obj. on the LED display. The accuracy of the measurements may be suspect, but the method was consistent. This is a 1:1 crop of the Nikon PL 2.5x 1mm slide. It measures 155mm wide and 672 pixels wide on a 2560 x 1400 LED display. The original image is 5616 pixels wide. The forum does not appear to support the BBCode [table][/table] directive. Thank you for the additional information. I think there's enough here for me to work with. So, let me try to explain. 2. The primary image formed by the objective (with assistance from the tube lens, when using infinity objectives). 3. A secondary image formed on the camera's sensor by the projection eyepiece. 4. The final image formed on your monitor or on a print. Whenever we speak of "magnification", we're talking about a ratio of sizes. It's important to be clear which sizes are involved. The numbers you initially reported are from 1 all the way to 4, what we might call "system magnification". 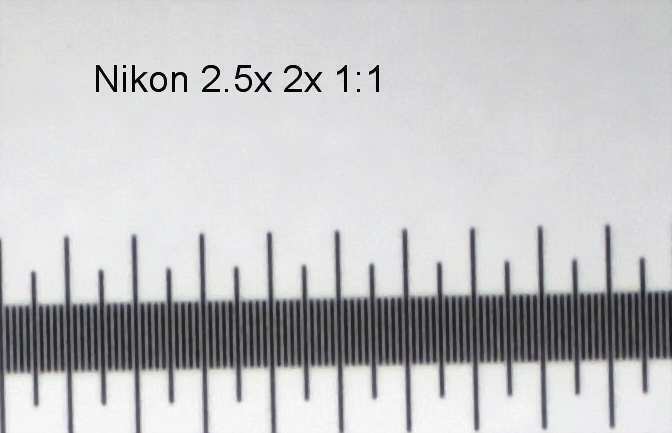 If 1 mm on subject becomes 47 mm on screen, then that's 47X for system magnification. System magnification is very helpful when you're talking face to face with another person, so you can point to a particular rendering and say "this image is about 250 times life size". But system magnification is not very helpful when the person you're talking to doesn't know the size of the final image that you're talking about. If you change monitor sizes, your "47X" changes too, even though the pixel count and resolved detail don't change at all. Subject to primary image: "objective magnification"
Primary image to sensor image: "projection magnification"
Subject to sensor image: "total optical magnification"
Projection magnification = 4.35X / 2.0X = 2.18X (for your Nikon PL 2.5X, as used in your configuration). I've continued to leave the quote marks on "camera magnification" because this number depends critically on your display software and your monitor size, in addition to the camera sensor. But in any case, at 10.8X your 36 mm sensor should be producing a screen image that's about 390 mm wide. It would be a very useful crosscheck to make that measurement. Yes, it explains a lot. I have taken to just stating the objective used as in most cases for what I do, knowing the actual size of the mineral grains is not critical. Measured 389mm with a cloth tape measure. If you are a tax agent, I have pity on the culprits. Good, I'm glad that things are making sense now. I think your strategy of just stating the objective is a good one for what you're doing. If exact measurements ever do become critical, you can haul out the stage micrometer again and just measure things. In earlier post, you wrote that "parfocal is not meaningful to me". There may be significance that you have not appreciated. In a well configured microscope, all the objectives are parfocal with each other -- you can change magnifications and need only minor tweaks to the fine focus. This same situation holds when the camera is parfocal with the usual eyepieces. But if the camera is not parfocal with the usual eyepieces, then different objectives won't be parfocal with each other either. Further, to be in focus on the camera under those conditions, each objective has to be dragged some distance away from its design point. That changes the actual magnification of the objective, and in addition it introduces aberrations such as curvature of field and spherical aberration. I can't say whether this matters for your application, because the magnitude of these effects varies widely depending on magnification and other details of the optics. But I thought I should cover the issue, for the sake of completeness. That's one job I've never wanted to do. In a previous life I did get pulled into one forensic investigation -- a fraud case involving some magically effective compression software. That was a very interesting investigation, and yes, the miscreant pleaded guilty on advice of counsel after reading the report. The 2, 4, and 10x objectives are very close to being parfocal. Within two turns of the fine focusing knob. The 20 & 40x require about three turns of the fine focusing knob. One turn of the fine focusing knob changes the focus by .1mm. There are adjustments on each objective, but I believe they are for centering. What are your tolerances for being parfocal? 40x > 20x 1/4 turn of the fine focus knob. 20x > 10x 1/2 turn. 4x > 2x one turn. I don't know about any standard, with my microscope with matched good objectives from the same maker and series I don't need to refocuse more than 30 micron, less in mosts cases. When mixing objectives from different makers maybe about half turn. With some cheap chinese microscopes I have at work I need to refocuse much more and I find it not acceptable. My microscope may have a USA brand name on it, but it was manufactured in China like 90% of all microscopes. As I have stated earlier and in other posts, I do not do research, I use my microscope photos for texture maps in a 3D programme and to create A1 sized prints to be viewed from 2m or more. My primary concern when taking microscope photos is to get the right illumination, contrast and composition. The microscope is really five interchangeable lens for my camera. Even my Canon zoom lens are not parfocal. I apologize if my use of microscopes offends anyone. I'm not offended at all. My goal is simply to help people get the results they want. I find it often helps if they understand the principles involved, so I try to work in theory as part of the process. You started off this thread by presenting some images and some numbers, and you asked for comments. Some of the numbers seemed unlikely, so I asked some questions, which you answered, until finally I think we have a mutual and improved understanding of what magnifications are involved, for example the Labomed "10X" actually giving more like 3.7X. Regarding parfocality, I initially asked about that in hopes of getting some better idea of how your equipment was set up. You replied that parfocality was not meaningful to you, so I mentioned some ways in which lack of parfocality might indicate other issues that would be meaningful. The numbers you've given indicate that there's no more than 5 turns of the fine focus knob, equal to 0.5 mm of focus movement between the two most extreme objectives, to maintain focus on the camera sensor. From the standpoint of the issues I raised, that's a small enough amount that I doubt you'll be seeing any significant loss of image quality from that source. However, I'm now curious about a completely separate issue -- what sort of comments were you were anticipating or hoping for in response to your initial posting? I initially thought there would be comments comparing the large images. Noting the CA in the Labomed and flatness of the Nikon. As stated, I am not a expert and expectations are not that high. Oh well, I can still build my mud brick model buildings.